Lenovo plans to build up its smartphone unit through the Motorola purchase, which may help offset its slowing personal computer business. 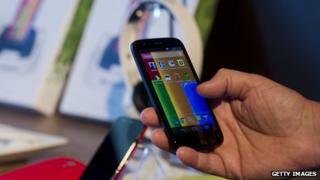 However, Google will keep the majority of Motorola's lucrative patents, which include one for Android software. In a statement, Google said the smartphone market was "super competitive" and that Motorola would "be better served by Lenovo". Google always said the motivation behind buying Motorola's mobile phone business was its patents. This deal sees it keep most of them. That will help it fight future legal battles to protect its Android operating system. The search giant had always kept the division at arm's length, in part to tackle any perception that it would give its own hardware an unfair advantage against other phone sellers. The outcome was that third-party made Google Nexus-branded phones often stole the limelight. Even when Google did invest in a reported $500m marketing blitz to promote Motorola's flagship - the Moto X - in the US, the brand only made slight gains in market share. A sale to Lenovo means Google can stop worrying about Motorola clocking up further losses. It will now be interesting to see if owning the brand can help Lenovo to do what other Chinese smart device makers have struggled at: cracking western markets. Can Lenovo do an IBM with Motorola? The purchase is set to make Lenovo the world's third-largest smartphone maker behind Samsung and Apple. Market research firm Strategy Analytics said in a blog post that Lenovo had made "a good move" and would benefit from economies of scale. "The Chinese vendor gets access to the valuable US smartphone market and the fast-growing Latin America region. This complements its existing global PC business. "For Motorola, it gains access to an ambitious sugar daddy that has a strong presence in the huge China market. For Google, it divests a loss-making hardware division," it said. This is the second major acquisition for Lenovo in the same number of weeks. Last Thursday, the Thinkpad-maker announced it had acquired IBM's low-end server business for $2.3bn, in what was then China's biggest technology deal. Shares of Lenovo being traded in Hong Kong fell by more than 8% following the announcement, which came after the US market had closed. "Whether Lenovo can turn around the long-struggling Motorola business, and what happens to the Motorola brand long-term, remain key questions that will need to be answered in the coming months," Strategy Analytics said. On a conference call following the deal's announcement, Lenovo chief financial officer Wong Waiming said they were not concerned that they may have overpaid for Motorola. "Market prices go up and down and I would not take a one-day or half-day performance as a reflection of the market viewing it negatively," he said. Mr Wong also said there was "no urgent need" for the company to tap the capital markets for money to fund the Motorola purchase given it had more than $3bn in cash available. The purchase of Motorola was Google's largest acquisition and it signalled a growing effort by the search giant to enter the hardware business. Motorola Mobility created the Moto X and Moto G phones. Despite the sale, Google chief executive Larry Page insisted in a blog post: "This does not signal a larger shift for our other hardware efforts." The deal with Lenovo comes on the heels of an acquisition spree for Google. In January, it snapped up DeepMind, a UK firm focused on artificial intelligence, and bought military robot-maker Boston Dynamics in December. In announcing Wednesday's purchase, Lenovo cited the strength of Motorola's brand, which has been revived in recent years with Google's help. "The acquisition of such an iconic brand, innovative product portfolio and incredibly talented global team will immediately make Lenovo a strong global competitor in smartphones," said Yang Yuanqing, chief executive of Lenovo, in a statement. "We will immediately have the opportunity to become a strong global player in the fast-growing mobile space," he added. He also noted the acquisition gives Lenovo an entry into the North American and Latin American markets, as well as a toehold in Western Europe. The transaction must still be approved by US and Chinese regulators.